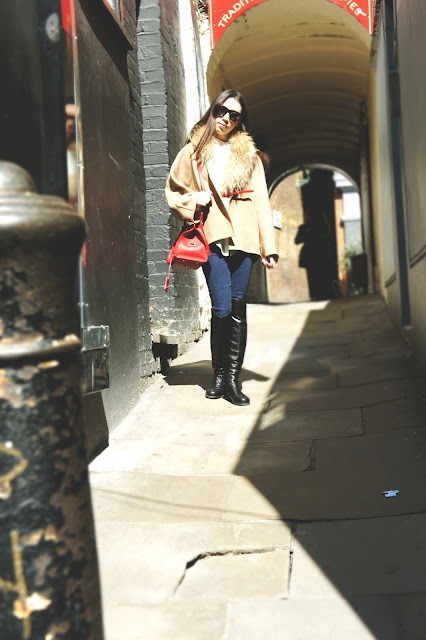 I am back with an outfit post with (fingers crossed) MUCH better quality photos than previously. I persuaded the BF to help out with taking some photographs and especially in this sunny weather in London! It's still a little chilly so I decided to go top heavy with a Dolman sleeved 'jacket' with a faux fur collar, and went simple on the bottoms with a pair of skinnies and a pair of slimming boots. On a more serious note, my heart still feels deeply saddened by the loss of Sita Chan. A beautiful and talented singer who, although I have not met in person, her beautiful voice has always been embedded in my mind. She had a bright future ahead of her and a tragic car accident took her and her angelic voice away from this world. Rest in peace, Sita. You are one of a kind and will be sorely missed. I went for a sophisticated chic look today with a mint shirt with a contrasting button stand and collar from Zara. This shirt is slightly out of shape, but there's something about a crepe shirt and concealed button plackets that I simply cannot resist. It's a great transition piece into Spring/Summer and to give it a nice contrast, I synched the waist with a complementary color - red. The red skinny belt has a slight peekaboo affect and also matches the bold red of my bag. 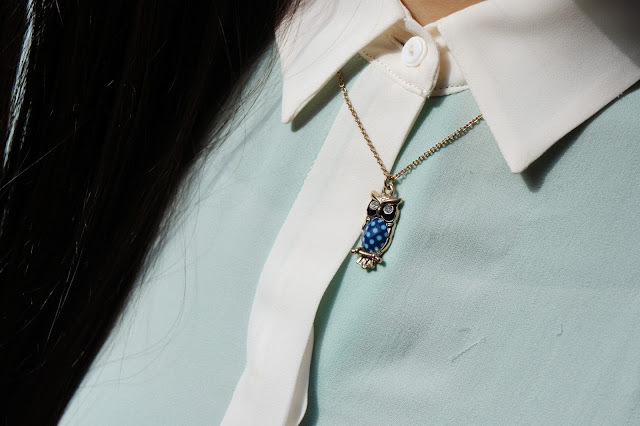 Lastly I added a very subtle necklace which has hints of blue that compliments the blue jeans I wore. I hope you enjoyed these photos and the outfit! Thank you so much for reading!